No gardening again today – it’s wet and mushy in the garden beds and gardening would just compact the soil. And I really don’t want to disrupt my beautiful poppy seedlings. They are looking so promising. I’ve lost great patches of self-seeding annual poppies every year due to enthusiastic weeding, or stepping in the beds when the seedlings were teeny. Not this year. 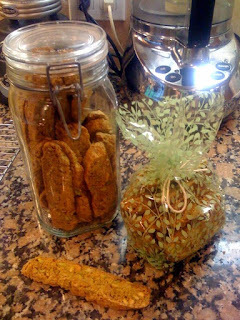 With no gardening to occupy me, I busied myself in the kitchen making biscotti for a gift basket I’ll need tomorrow. This little bag of biscotti, a jar of jam, a box of tea. Seems perfect when it’s cool and wet and rainy. Everyone loves these biscotti. They satisfy the need for sweet and for crunch. They are great for dunking. And they have no butter (but lots of eggs.) These are thin biscotti, not big cakey things. Easy to make, easy even to double the recipe. Play with the citrus/nut combos – orange-pistachio is our favorite, but lemon-almond is great. Adding chopped dried cranberries or sour cherries is delicious. Lately, I’ve been thinking about candied ginger and lemon. I might miss the crunch of the nut, but I am craving a serious ginger flavor. Dried apple and caramel maybe with peanut or cashew? Dried mango and coconut? Endless possibilities. Place dry ingredients in bowl of electric mixer with paddle attachment. Whisk together egg, vanilla, zest. With mixer running on medium speed, pour 1/2 egg mixture in, then add nuts, then finish with remaining wet ingredients. Run mixer until dough comes together well and pulls away from the sides of the bowl. Form two 12″ logs. The dough is sticky. Brush with remaining egg white and place side by side on a baking sheet. Bake on parchment lined sheet at 350 for 20 min. Remove from oven and cool on racks for 15-20 min. Slice biscotti on an angle, about 1/4″ thick and place on baking sheet lined with parchment. Bake for 5-6 min. per side, turning once. Cool on a rack. Store in closed jar, will stay fresh for a week, if they last that long. On Saturday, I made focaccia for a party. This is just the easiest recipe and now it’s such a staple, that I start the bread in the morning when serving soup for dinner. It makes that soup dinner seem so much more special when warm bread is served, too. 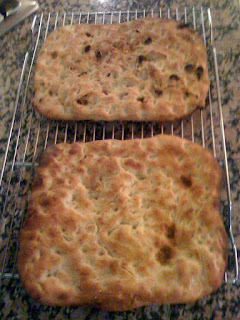 The secret to success with this focaccia, and really with all breads, was taught in a cooking class with the incomparable Christine Ilich at L’Academie de Cuisine in Bethesda, Maryland. Christine in the most amazing baker. I’ve attended three or four of her classes and have learned things each time that completely changed the way I baked. The biscotti recipe is hers, as is this focaccia. Christine’s big secret is “Step Away From The Dough.” When you first stir flour into water or whatever liquid you’re using, step back for 10-15 min. When you return to the dough, the flour will have magically absorbed the moisture and the dough just comes together. By doing this, you will add significantly less flour to your recipe, making for a lighter, airier dough, and breads requires hardly any kneading. Put yeast and water in bowl and stir to dissolve. Let sit for 5 minutes. Stir in oil, salt and 1 c flour and let stand for 10-20 min. Split dough into two portions. Add rosemary to one half and tomato to the other half. Add 1/2 c flour to each half and mix to a rough shaggy mass. Rest dough for 10-15 min. Return to dough and knead lightly. The dough is very sticky and elastic when complete. Place in an oiled bowl, cover with plastic and place in the refrigerator for at least four hours and up to a two days. It gets bigger holes and a more sour flavor with longer cool rising. Take doughs out of fridge and plop onto two well oiled, parchment covered, baking sheets for about an hour. Gently press the focaccia out to finished size (about 14″x14″) and then dimple the surface lightly with your fingertips..
Let focaccias rest for 15 min., then brush with oil* and sprinkle with very coarse, very tasty salt. Bake 20 min. or until golden brown or to an internal temp of 190. *I used sundried tomato oil for the one with tomato, and meyer lemon oil for the rosemary version, but a good EVOO is just great.